Investing in British art seems a great thing to do. You might consider reviewing catalogues from the many British Art Galleries, browse the art auction houses or look for your own masterpiece in flea markets in the hope of hidden art treasures. But is it a strategy that will result in making you rich? Judging by the amount of people we see at Red Rag asking about British Art and British Artists for Investment obviously many think buying for investment is a good idea. However when asked about buying art for investment our answer remains the same - we recommend that you buy contemporary British Art only if you like it and not based on art investment decisions. However buying British contemporary art is on the up and galleries selling paintings are reporting demand is outstripping supply ' particularly at the high end of the market. Some of this is definitely down to people seeing good increases in the sale of contemporary art. And, as a result more people have bought driving art prices even higher. Increases in value have been evident for works of art from living and dead British artists. The added dimension of seeing art values increase whilst enjoying the art at home have proved increasingly attractive for some art collectors. In such cases it is easy to understand that some British art collectors achieve an added element of enjoyment towards the art works they have purchased. Certainly British Art collectors who purchased artist Ken Howard's contemporary paintings as investments in the early and mid 1990's should feel well satisfied. Ken's paintings have seen good increases in price with strong demand for his art works from British Art Galleries and art auction houses. For those who can not resist the temptation of investing in art we have attempted to provide some guidance about investing in British art. Happy hunting! The world of British art is not an easy one for amateurs to navigate even for the experts. The art world is notoriously difficult to understand. However as with other investments the more you know about art ' the better the likely return. On that basis you need to spend plenty of time understanding your chosen art market. Achieving a basic knowledge of today's British Art market in which Red Rag Gallery specialises is a big task. If you extend your area of interest to the art works of dead British Artists the task becomes even greater. The best strategy is to concentrate on specific areas and learn as much about the subject as you can. Apart from regular and diligent research through books, magazines and Internet you should visit as many art exhibitions as possible. There are hundreds of Art Galleries where you could ask both gallery staff and exhibiting artists about the art subjects which are of interest to you. The main thing is to choose art you like. By doing this you are more likely to make the effort needed to fully understand it. Even then knowing exactly what art you are looking for can be incredibly difficult. This is because the art market is so large and extensive. You should ideally concentrate your initial art search to a manageable size. This will vary from person to person but even if you decide to concentrate on present day living British Artists there is more segmentation needed. For example: Geographic areas- Scottish Artists, Welsh artists, British Artists or Irish Artists. Then there are the various art genres to consider such as: Figures, Portrait, Marine, Figurative, Realism and Conceptual Art. In addition you need to consider the type of Investment Paintings ' Oil, Acrylic, Watercolour or Drawings. Determining what art you are looking for will take a long time but if you are serious about investing in art it is essential to know and specify your niche. It might appear attractive to buy young unknown British Artists before their paintings rocket in value ' but the odds of success and often quality of the art make it a high risk strategy. Remember the best art by artists whether they are established or emerging is likely to appreciate more in value then inferior work by the same artist. So buy the best art you can afford ' preferably by the best (proven and established) artists. It is always advisable to buy quality art with original framing. 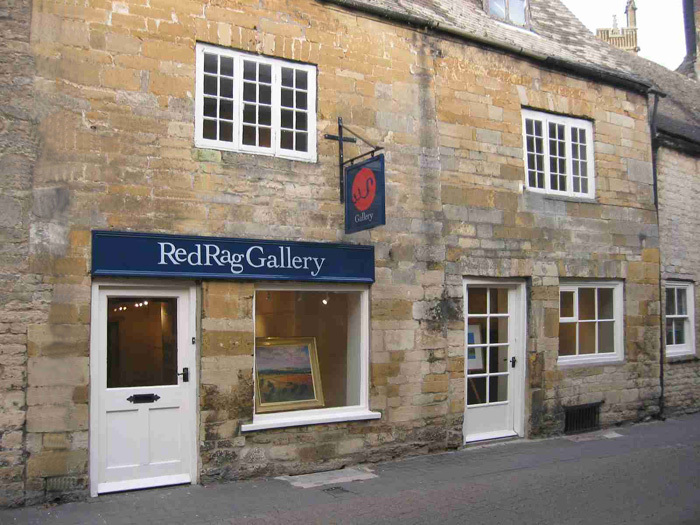 All Red Rag British Art comes direct from the artist's studio ' but if you are going to buy older art remember to look for any damage. Paintings can be repaired but value will be enhanced and better maintained by paintings in pristine condition. If you are not buying new contemporary art ' try to buy art with a documented history. A good provenance may cost more but the re-sale value and desirability is significantly enhanced. This is particularly the case if the painting has an interesting history or is of significance in the artist's career. A key quality stamp needed for art investment is the artist's signature. So always make sure when you buy art that it is signed or initialed. Without it generally selling becomes more difficult. Finally remember to keep the paperwork for your own purchases. They form an important part of the paintings history which will be of interest to future investors. Most artists will paint hundreds of paintings over their lifetime. Their art styles and subjects may vary enormously. Buying art for investment means you need to know what are typical benchmark paintings for each artist. For example: a leading British portrait painter may have painted many subjects, but a painting of the King or Queen is likely to be more valuable than a portrait of the artist's next door neighbour, or of a Landscape painting by the same artist. You will also probably find Oil paintings by an artist to be much more collectible and valuable than watercolour paintings by the same artist. Looking at a contemporary painting on a price per square inch basis you will find small British Art paintings are priced higher than larger paintings. The major reason for this is to do with market demand. There are always more art buyers who have the budget and physical space in their art collection for small paintings than larger paintings. Finally Look after your Investment ' it pays to look after your British Art. In the long term attrition is one of the basic reasons why paintings and sculptures increase in value. Eventually fewer items survive and those that have survived usually deteriorate. If you look after your British Art investment and take care of it, then it will fetch more than the average in the future.